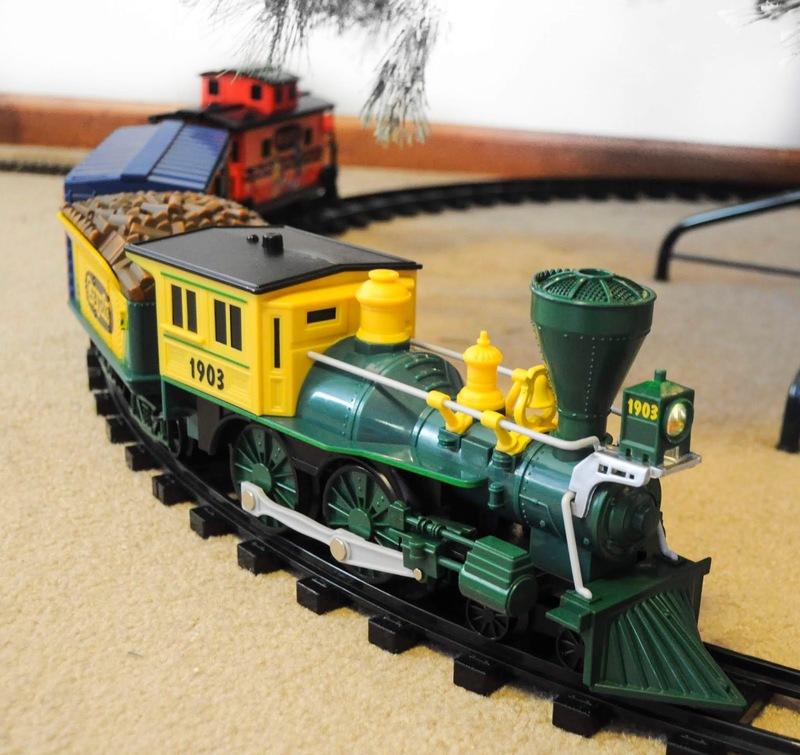 For Christmas one year my husband really wanted a toy train. We both liked the Lionel train line. I especially loved the Crayola train. 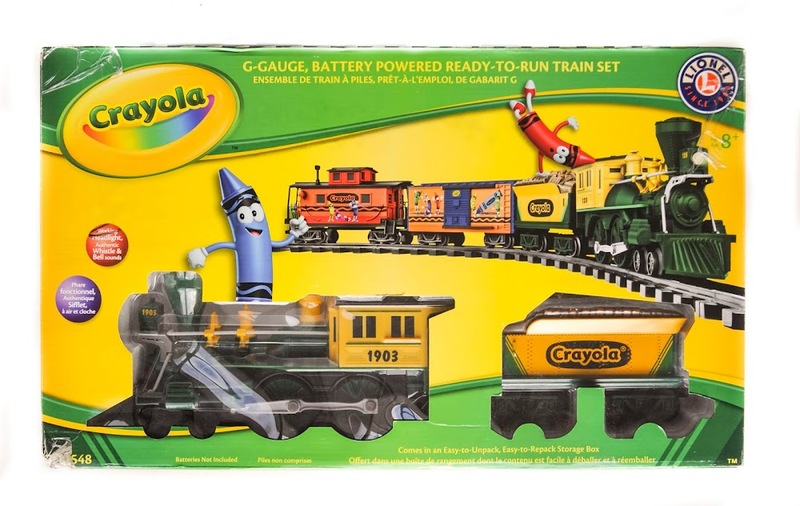 When it came time to decide we picked the Crayola train even though he really wanted another one. Click here to find on eBay or Amazon. Prices may vary on both sites. 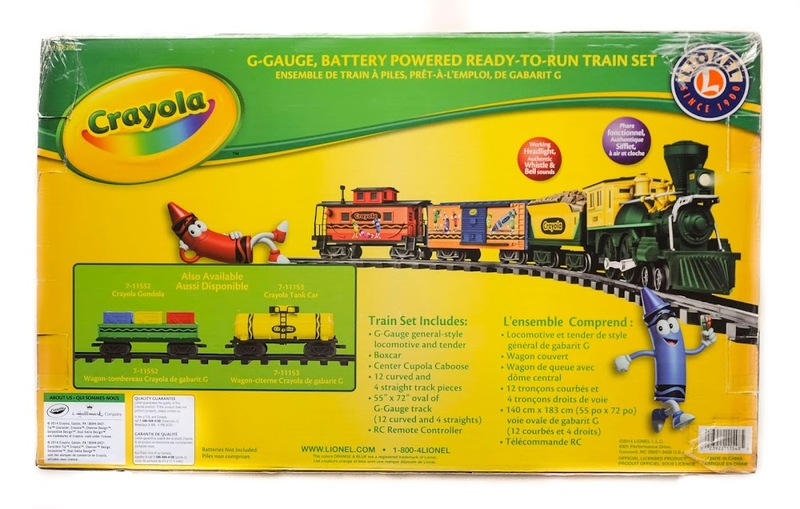 The Crayola Lionel train is a G-Gauge train. For non train folk like myself, that means the train is 1:24 to scale. These tracks are wider than smaller train sets and run with a remote control, able to go backwards and forward with bell and whistle sounds. Lionel also makes a Hersey's, Harry Potter Hogwarts Express, Polar Express, Coca-Cola, Snoopy, John Deere, Mickey Mouse, thomas and Friends, and Frosty the Snowman train. 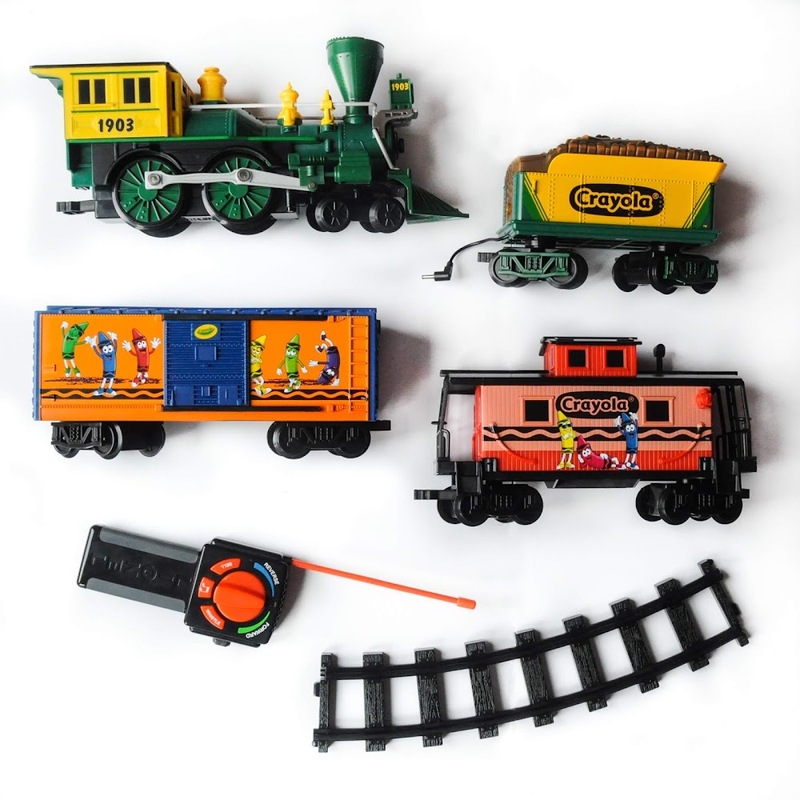 This set includes a locomotive and tender, boxcar, caboose, 12 curved track pieces, 4 straight track pieces, and an RC remote control. The track can either be 55" circle or a 72" oval. 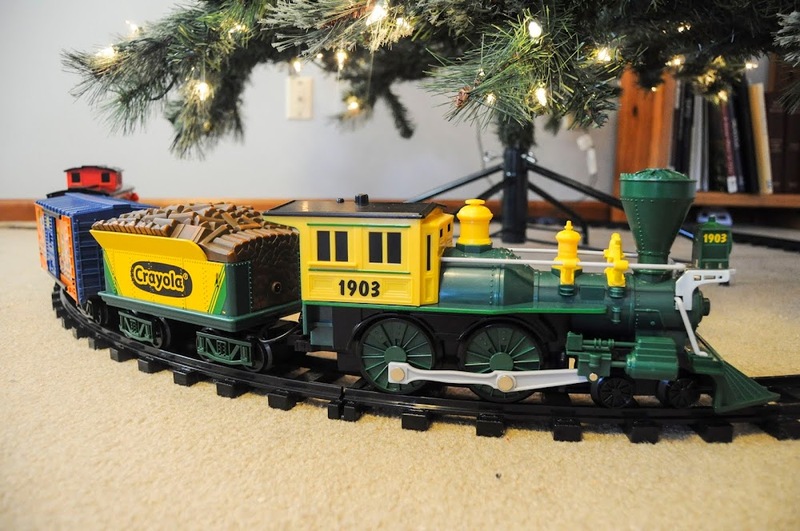 My kids LOVE this train set and can't wait for Christmas every year when we put it around our tree. We bought a lego train to put around a smaller tree. This train is going strong in it's fourth year. The tracks can be a little tricky to get clicked and can come apart easily, but they also go back together pretty easily too. In addition my kids love to build a shed for the train out of Duplo blocks. I would definitely recommend this train. I am not going to tell my kids about the other sets because they will probably want them. When we lived near Kansas City we used to go Union Station where they would put up a ton of trains for the public to see at Christmas time. They also put them up during the year, but there was not as many. We would also hit the Crayola store while we were there. 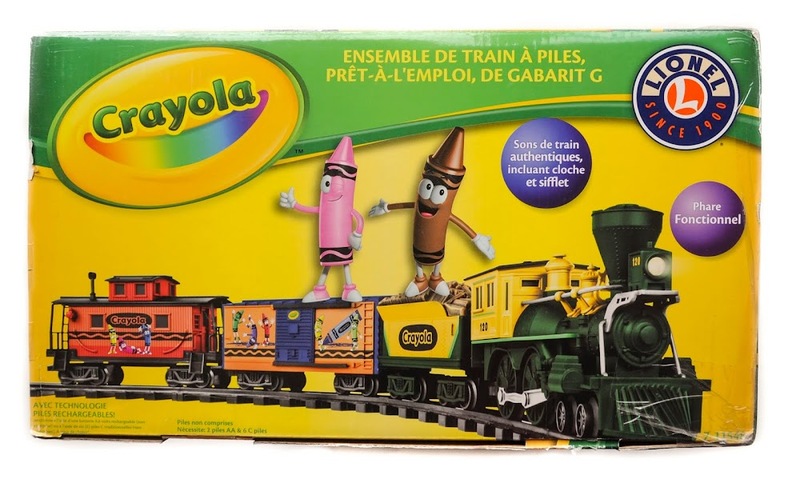 There are other Crayola Lionel trains. This is the current model. A gondola and tank car can also be purchased separately. 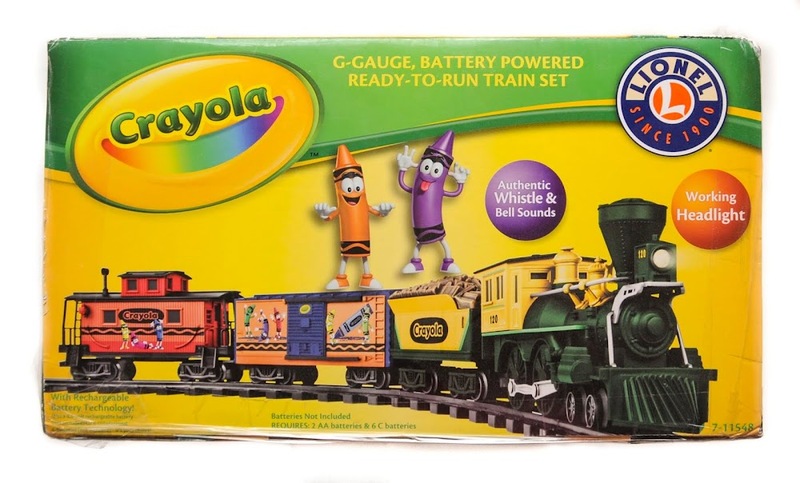 This is highly collectible being a Lionel train set and a Crayola product. Unfortunately when we moved the movers taped my box all together and wrote all over it. I photoshopped the marker out. I was not too happy. The box also contains French on the bottom and the side so it can be simultaneously sold in France without rebranding the box.